The sudden uptick in digital payments following the most disruptive reform measure in recent memory had turned out to be a watershed moment for digital wallet companies such as Paytm, MobiKwik and FreeCharge. But six months into the 8 November announcement, the Centre’s new-found optimism around India as a less-cash, digital economy seems to be taking a beating. This, at a time when the jury is still out on whether the move was dictated by economic logic or political considerations. According to data released by the Reserve Bank of India, while November and December witnessed a significant spike in both volume and value of digital transactions, the numbers came crashing down in the following two months before rising in March. Though data for April is yet to be released, a further contraction is expected. 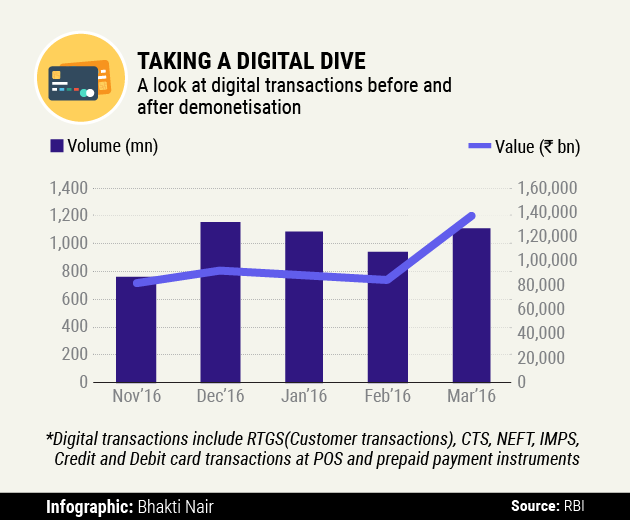 Digital wallet players were the biggest beneficiaries of the demonetisation move. Paytm, MobiKwik and FreeCharge clocked stellar growth. In the two months following the announcement, Paytm, which is by far the largest wallet company in the country today with over 200 million users, claimed to have signed up more than 20 million new customers. In November-December, it clocked seven million transactions per day, and ended the fiscal year at 1.5 billion transactions, and gross merchandise value (GMV) of about $5 billion. The Alibaba-backed company had spent nearly Rs 2,046 crore in acquiring customers for 2016, while it has set aside another Rs 500 crore for its 2017 marketing spends. Gurgaon-based MobiKwik, which claims to have about 55 million users on its platform, also announced a Rs 300 crore 2017 budget to acquire customers. It had spent Rs 50 crore to set up 13 offices and hire over 1,000 employees. The government, too, joined the wallet party with its own app, BHIM, which was based on the Unified Payments Interface (UPI) platform that links customers directly to his or her bank account, instead of storing money on the app. Besides, the roll-out of Aadhaar Pay and Bharat QR within a short span of time paid rich dividends. The game-changer, however, was BHIM, which claims close to 20 million app downloads, and the government has set aside Rs 495 crore to promote it over the next six months. 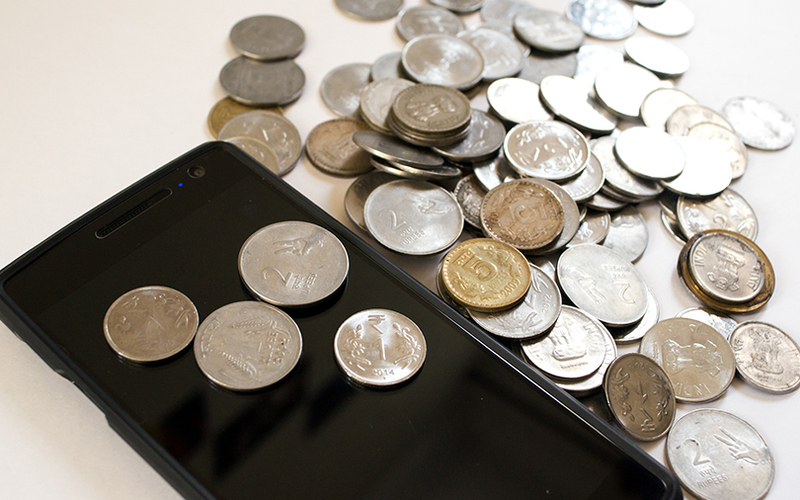 However, despite the eyeball-grabbing marketing initiatives by both private and public wallet companies, the Indian consumer might not stick to mobile wallets for too long. 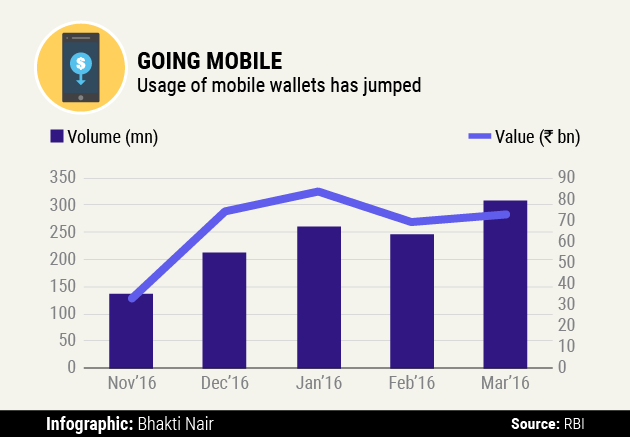 According to RBI data, wallet transactions, which had skyrocketed in December 2016, dropped subsequently with enough cash entering the market. Digital payments peaked again in March with 307 million transactions – an increase of 24% month-on-month. Besides, employees often get their annual or half-yearly reimbursements, which leads to more cash in hand during the time, which increases the purchasing power. The average ticket size for wallet transactions has also come down since December. In March, the average ticket size was around Rs 237 – down from Rs 279 in February, Rs 319 in January and Rs 349 in December. A lower ticket size typically implies that wallets are being used for making payments of smaller value at small merchant outlets. A lot has been written about the UPI, which was formally launched in August 2016 by National Payments Corporation of India, and its benefits. Experts VCCircle had earlier spoken to felt that the UPI has the flexibility and ease of use that could see it topple mobile wallets. RBI data for the UPI proves their point. Transactions across the UPI hit 6.9 million in April against 6.2 million in March 2017. However, in terms of value, there was an 8% decline from Rs 2,390 crore in March to Rs 2,200 crore in April. Since December, UPI transaction volumes are up 252%. 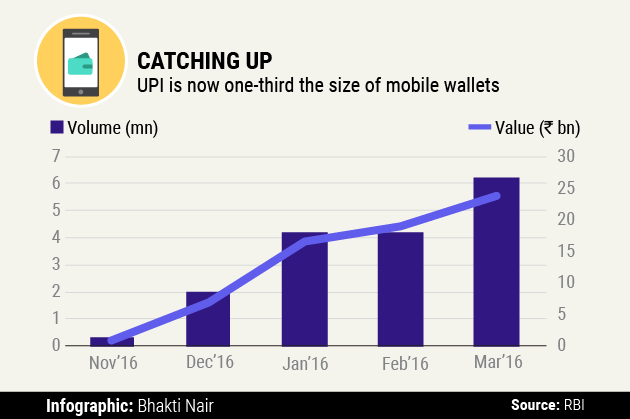 “Once the UPI’s acceptability increases, wallet usage will increasingly come down. I don’t know for how long the wallet firms can keep luring customers with discounts. Once the discounts stop, the UPI will be a cheaper and secure alternative available,” adds Nagra. In fact, the UPI could become the dominant mode of digital payments in the next 18–24 months. “2016–17 will probably go down in history as the year that changed India’s payment landscape forever,” writes Kalaari Capital managing partner Vani Kola, in a post on Medium. Even though the March numbers for all digital payment tools have jumped, the complete April and May data will only be able to reveal the real status of digital payment, especially wallets. Whether the numbers justify the kind of investments that have already gone into bringing digital payments to the masses. UPI transactions in coming months will perhaps be the game changer the government is pinning its hope on for a less-cash, digital India. *This is the second part of a two-part series on how the government’s banknote ban affected the overall economy, key sectors and the digital payment ecosystem. For the first part, click here.